Thomas Becket was born on the Feast of St. Thomas Aquinas in 1118 AD, in London, to Norman parents and was raised within upper class society. He was educated at Merton Priory in Surrey and was later sent to Paris to study. After several years in Paris, Thomas returned to England where he joined the staff of the, then Archbishop of Canterbury, Theobald. It was helpful that Theobald was a distant family relative; however, he did not remain in England for long and the Archbishop sent him abroad again to study law. These years provided a privileged introduction to the political realms of church and state. In 1155 AD King Henry II chose the young Archdeacon Thomas Becket as chancellor, and their friendship grew both professionally and personally. Theobald, who saw in Thomas a close ally to the king's confidence, supported this. Theobald also consulted extensively with the saint and after Thomas was ordained to the diaconate made him Archdeacon of Canterbury, a position below only the Bishops and Abbots. 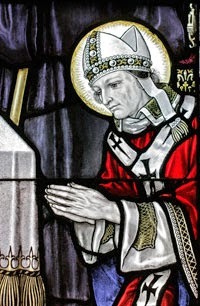 Thomas was also sent to Rome for the archbishop when required. Thomas was a proud and quick-tempered man throughout his life, but despite his extensive "worldly" business and attachments, his confessor testifies to his innocent character. He was also known for times of personal discipline and devout prayer, so his life seems to have been of somewhat dichotomous natures. In 1161 AD at Theobald's death, King Henry was responsible for choosing the successor. Even though Thomas had objections to being consecrated, King Henry “persuaded “ him of his need to assume the Archbishopric as Thomas had been acting as Chancellor but he had not risen in the Church as he might have and did not hold a particularly high 'rank'. Because of this, in 1162, on June 2nd he was initially ordained as a priest and then ordained as a Bishop on the following morning. He was then made Archbishop later on the same day. Thomas's refusal to maintain both positions began a dispute between the two friends, which grew as they differed over the roles of church and state. Their relationship disengaged completely with Becket's outright dismissal of the Henry's Constitutions of Claredon. The change in Thomas after his sanctification was all encompassing. He established a rule for himself. He doubled the alms given to the poor, examined the candidates to the priesthood personally, reorganized the Archiepiscopal household in a monastic style, visited often the monks in their cloister, and became moderate and tempered. The relationship between Thomas and Henry remained for the most part the same during the next year. It was likely that Henry believed that with his friend in the highest office in the Church in England there would be an easy alliance between Church and State. However, when King Henry was amending laws to place the State in a position to take charge of cases involving the clergy, the trouble started. Thomas originally agreed to the changes but then changed his mind and did penance to show that he had been wrong in his original decision. This act, in those days, was considered a considerable 'slap in the face' for King Henry. As a result, Henry called Becket to Northampton and asked him to account for sums of money that had passed through his hands while he was chancellor and then later as the Archbishop of Canterbury. The conflict caused by these accusations was extreme and Thomas, already well liked by the general population, was helped in October 1164, to flee England for France. Exiled with him were members of his family, who settled in parts of France and the Low Countries. Thomas remained in exile in France for six years, with the support of the King of France, first at Pontigny and then at Sens. In 1169, while he was still in France, he excommunicated the Bishops of London and Salisbury who had stood against him and supported the King. In 1170, while King Henry was in France, Thomas returned to England and landed at the Port of Sandwich. He was cheered by many of the people on his return. In the meantime, back in France, the most ardent adversary of Thomas, who was Archbishop Roger of York, had the support of the King. Archbishop Roger, who, as Archbishop of York would have been number two in the chain of command of the Church in England, suggested to King Henry that, ‘as long as Thomas is alive there will neither be peace or tranquility in the kingdom'. This suggestion threw the king into one of his rages. The conversation was overheard by four of his knights who decided that they could gain great favor by dealing with the problem and left immediately for England. The knights were; Richard Brito, Hugh de Moreville, Reginald FitzUrse, and William de Tracy. They traveled to Canterbury and arrived there in the late afternoon of December 29th, 1170. One account tells how the knights at first just grabbed at Thomas but he pushed them away and in fact knocked FitzUrse to the floor. At this point, FitzUrse drew his sword and threatened the Archbishop. The Archbishop replied with the words, " Now to Almighty God, to the Blessed Mary ever Virgin, to the Blessed John the Baptist, the holy apostle and Paul, to the blessed martyr Denys, and to all the Saints, I commend my cause and that of the Church”. De Tracey also drew his sword and called out, "Strike! Strike!" to the others and delivered the first blow. It took three more wounds before Thomas went down but then Brito delivered the final blow, which actually severed the top of the skull. The tip of the sword came off with the power of the impact. King Henry was greatly disturbed by the killing and the guilty were eventually hunted down. In time, the King humiliated himself in penance by walking through the street without shoes and enduring a flogging by rows of monks. Henry capped his atonement by spending the night in the martyr's crypt. History tells of a great storm shortly after the death of the Archbishop and people flocking to the Cathedral to grieve for him. Three days after this there began a ‘series of miracles', which are depicted in 'the miracle windows' and were credited to Thomas. Pope Alexander III canonized the Archbishop in 1173. Immediately after the murder, the body of the Archbishop was prepared for burial and laid in state before the high altar before being taken into the East End of crypt where it was quickly buried at the back of the altar of the Chapel of Our Lady Undercroft. The remains of the Saint were kept in this site from 1170 to 1220 when they were moved to a new location in the Shrine, which had been constructed in the Trinity Chapel. Henry VIII ultimately ruined the Shrine in 1538 as a symbol of the victory of State over Church, for Becket's martyrdom represented victory of Church Over State.